Seeds and Tubers On the Way! We still have pole beans, bush beans, Ireland Creek Annies, radish, spinach, pie pumpkin, cucumber, carrot, Coral shell peas, tomato, and bell pepper seeds as well. We’re picking up a couple different tomatoes this year – Oregon Spring and Principe Borghese Cherry – as the Glaciers and San Diegos didn’t seem to do too well. I’m really excited about growing bergamot, catnip, and chamomile, as it will lower our necessity to buy tea a ton, especially when you consider that we already have a surplus of mint in one herb bed. For potatoes we decided to be a little more selective this year. Last year we bought the “classic keepers” variety pack which really helped us to take note of what does and doesn’t grow really well for us. Out of the five types we got to try, we’re ordering Kennebecs and German Butter Balls, both late varieties. We’re also going to take a stab at Rose Finn Apple, which is an early fingerling, and Red Golds, which are about a mid season potato. I’ll update more on what the gardens will look like and such later. Well, we finally got hit with another ice storm. Took fifteen years for it to happen, but she’s here, that’s for sure. It’s been raining ice since Saturday night. I’m proud to say, though, that I was preemptive on bring wood to the front of the house. 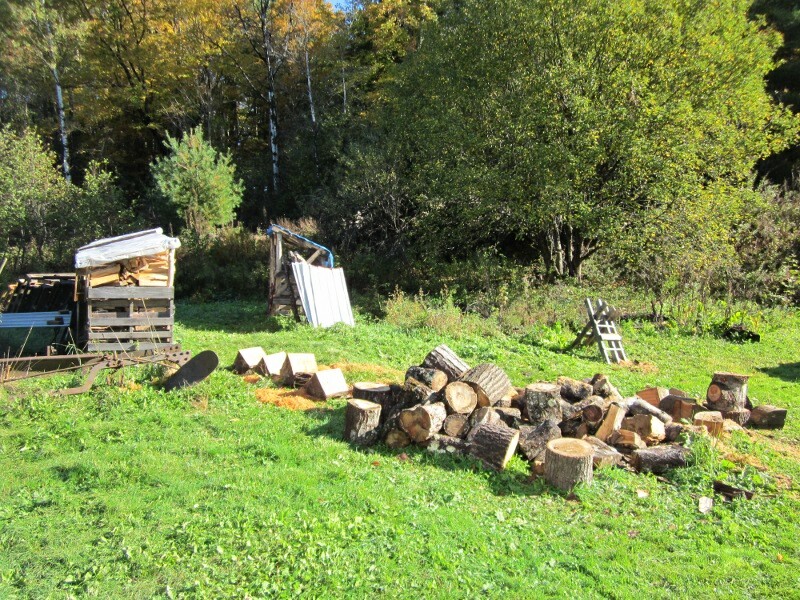 On Friday I filled the front bin, the empty half of the kindling bin, and brought in enough wood for two full days to be dried out around the stove. Needless to say, we still have a good stock pile no more than five feet from our front door, which is a godsend as the only way we would be able to get to the woodsheds right now is via ice-cleats and a pickaxe. Hubster used the massive halogen work lights I bought him last year to finish up the interior structure of the new shed during the middle of the rain/icestorm. It’s a little too flimsy to leave it to its own accord in a Maine winter, that’s for true. The chickens, dog, Little Mister, and this homesteader are all getting cabin fever, however. Given that the past three weeks have been too cold for walking (all except for one day and we only got in half a walk as Diamond split her nail that day – on the walk of course), and now with the ice which will be dissipating tomorrow only to bring in more arctic cold…Well, we’re stretching to find things to do. Yesterday we used cardboard box, copious amounts of ducktape, and a bit of imagination to make a garage with barn doors for Little Misters various vehicles. I have no idea what to do tomorrow, though. He’s refusing naps now and doesn’t want to hang in his room by himself anymore. Today was a bit of a “win” as he’s now napping (with Bubble-Mater in bed with him) and actually played in his room for half an hour. I’m trying my hardest to try and get him back on a schedule that will also help me get time for thesis work next semester. Here’s hoping all works out, right? Bribery with a popcorn lunch is a good thing, don’t ya think? On the plus side, with all this stuck-being-indoors, my house is slowly getting cleaned up, which means after my “sabbatical” from thesis work is over at the end of this week, I should be able to crank out more work without having to worry about things. Oh, that and get some very early seedlings goings. Right now I’m looking at getting some greenpeppers started severely early, along with some herbs and lettuce, in hopes that we might get the chance to get a mini-greenhouse constructed out of pallets and windows either during a January thaw or early in March. One can dream. The Christmas and Yule decorations are put away and another festive season has ended just in time for the round robins of nor’easters to start. Today’s storm is slated to drop 10″ – 18″ on us. Who knows what next week’s storm will grace us with. In the meanwhile, we stoke up the fire, throw on an extra layer, and huddle like chickens in our coop, keeping warm and fed. While this seems like a long list, I’m hoping to add more variety in the follow years as well, but this was a good start that the hubby and I agreed upon. Given that the entire north garden will be converted to raised beds, we definitely have our work cut out for us. On the plus side, all the gardens are fenced in now, so that’s one less thing on the list. As far as where we’re going to get our seeds, the answer to that is easy: FedCo Seeds. After having very submarginal luck from store-bought seeds, we decided that this year we’re going to go with a company known for their quality – both in seeds and service. More importantly, this ensures that we’re buying from lines that are able to survive in the north east regions and we’re helping to keep other farmers going. Please, even if you’re only doing containers, buy from FedCo, not Agway, Walmart, or any place else that sells seeds! Now that I’m done my public service announcement, what do you lovely folks plan on planting in the spring? So for those who may have not heard, the Raymond family will be taking a trip out to New York. The man of the house has training to do out there for work. We’ve been blessed that work will pay for the wife and the kiddo to go along, as no one in this house has even been out that way. As nerve wracked as we all are about the upcoming trip, we lucked out and will have a very awesome family friend who has dealt with both anxiety riddled dogs and chickens before staying at the house. With a house/criddo sitter lined up, the stress is reduced some, but it still means that there’s way more to do than there are hours in the day. The gardens still need to be finished up for the winter. Seeds need to be collected from some areas, and others need the carcasses of plants pulled up and composted. Manure needs to be laid down for winter, or at least a layer or two of newspaper. There are a few beds (lettuce and broccoli) that will remain untouched as an experiment to see if theses things will indeed come back year after year. 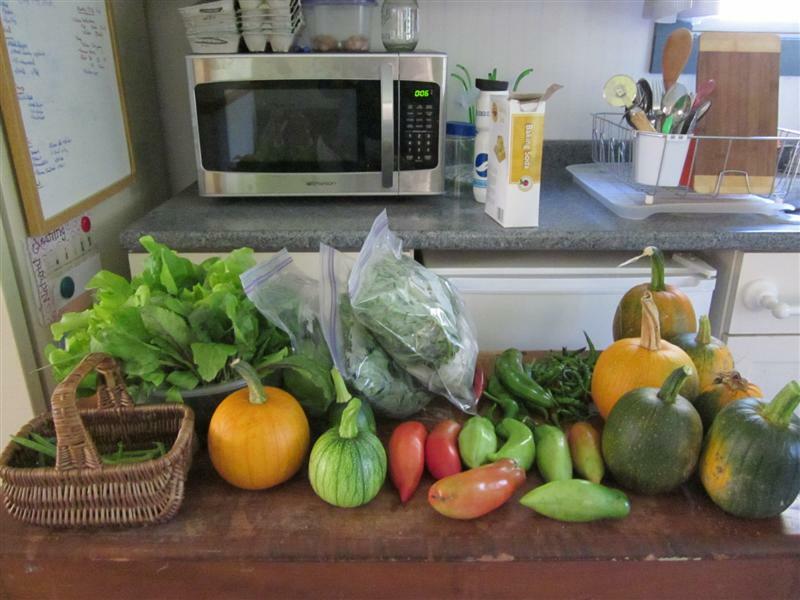 We’ve collected all the hot peppers, bell peppers, carrots, cucumbers, and lettuce that we could eek out of the gardens. Now we’re simply waiting for the beans to finish drying up before we can harvest the seeds. This year we’re planning on gathering the usual bean seeds – both bush and pole style – and pumpkin seeds, but we’ll be adding in cucumber seeds, basil, hog’s heart tomato, Cheyenne, and stuffing pepper seeds. With any luck, we’ll be able to sprout them next spring. We’re slowly gaining on our wood needs. The kindling bin is half full. We have two and a half cords cut, split, and stacked. About a third to a half cord lies in wait for the ax. We were gifted three Ranger fulls of wood by Uncle Dennis and Aunt Leona. There are also a few trees on the side of the road that we’ll be weeding out. It will be tight seasoning some of it by the time we crack into it, but at least it will be there. We may need to resort to borrowing or renting a splitter to get it all finished up, however. There is plastic waiting in the basement for the windows, and scraps piled up to make a couple window quilts to help cut the draft on the kitchen windows. Clothes still need to have holes mended, blankets need to be washed and laid out, and inventory needs to be taken of things to knit. Planting supplies needs to go into the basement, and the shovels need to arise from their slumber. The next three weeks will be crazy, to say the least. Wonderful, eventful, busy, and crazy, but we’ll be loving every minute of it. Tonight will bring our area of the North East its first frost/freeze warning. Normally I don’t get too bent out of shape when it comes to these things. I might put blankets over some of the more delicate plants, and say a quick spell or two to the gnomes and such, but the map that was put up on the local weather channel shocked me. Taking a word of advice from my intuition, and letting the wind wrap around my face so I could feel its bite, I decided to run amuck and collect all the produce left on the vines and still growing. It’s a small harvest, to be sure. We didn’t have much luck with the produce this year, with the exception of the beans that we’ve been picking like mad and the cukes that have already come and gone. The lettuce is our second crop, so I guess I can’t complain too much on that spectrum. While it seems like a little, we’re thankful for every bit of it. We will still be covering the tomato and pepper plants, along with the small bits of lettuce that I’m hoping will survive and have a little longer to grow. Part of me hopes that I pulled everything a bit prematurely and Mother Nature will prove my instincts wrong. The problem with that: I’ve been correct on our winters the past two years. Sometimes it stinks to be right. Oh, and as you can see, that’s a desk temporarily in front of the cupboards. 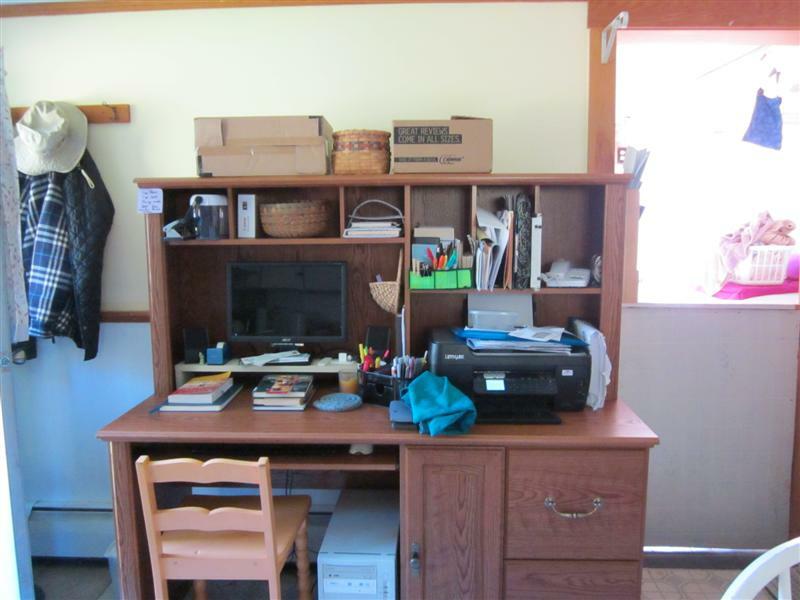 It was the computer/office desk and will be moved upstairs shortly to be a sewing/knitting machine desk. As a gift to ourselves, we welcomed in a new piece of furniture into the home that will hopefully entice us to be more business oriented when it comes to the homestead and will allow me to think/work more professionally on my thesis.